All PW spot welders are built to last. Large transformers allow proper production duty cycles and rigid frames minimise deflection. Rocker arm units for light duty work and machines with direct acting cylinders for faster response and higher weld quality. All welders above 30kVA can be supplied with a range of controls, from the simple analogue WK to the sophisticated WS2003 and WS4000 range, delivering all the high end control features required in high quality production environments. 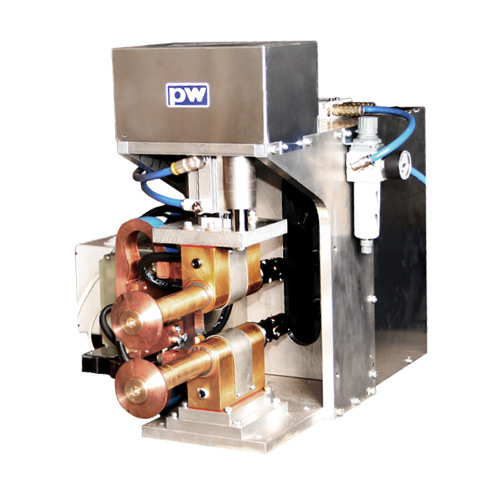 Precision seam welder for thin materials, with WS700mS control. Pedestal Welder, air operated with 700mm reach and WS2003 weld control. Features sliding beam head and very rigid construction for high duty work.